What we commonly refer to today as the Muslim world – did not become overwhelmingly Muslim until some two and a half to three centuries after the initial conquests. In this context some of those who defined the very parameters of Islamic thought, life and society such as the founders of the various Schools of Thought died as minorities whilst ever-present contingent of anti-religious critics who openly attacked Islam, and produced ‘rival Qur’âns’ and dismissed the Prophet (saw) as a charlatan. We could go on like this. The point, however, is that their status as numerical minorities did not prevent the early Muslims from translating their religious commitments, alongside their thoughts, dreams, fears, obsessions and talents, into an organic articulation of Islam, not as an abstraction but as a concrete way of being in the world that both resonated in and captured the mood and imagination of society. Indeed, this – and not any fear of forcible conversion – is what facilitated the continuing spread of Islam. (After all, had forced conversion been the norm, it would not have taken 300 years for the population to become majority Muslim.) To be sure, these early Muslims faced serious challenges, as they lived and operated in societies where the dominant culture was routinely far more advanced, culturally and intellectually, than the culture and civilization brought by the original conquerors. But rather than shrink from this challenge, they boldly got to work, committing everything they had to the enterprise of carving out a dignified existence for Islam in their homeland. This was not always a smooth and unproblematic enterprise. Mistakes were made, wrong turns were taken and they even got their intellectual noses bloodied on occasion. But rather than just sneer at society and then withdraw in the face of what had to feel at least at times like impossible odds, they pressed on – and ultimately prevailed. The need for the development of an indigenous Islam in the west, and suggestions of the cultural goals that the communities of the west should have, without falling into the trap of thinking that there is one blueprint or one vision which is the panacea for all of our ills. Professor Abd al-Hakim Jackson is a respected scholar and one of the foremost authorities on Shariah and Islam in America. Dr. Jackson is the Arthur F. Thurnau Professor of Near Eastern Studies, Visiting Professor of Law and Professor of Afro-American Studies at the University of Michigan (Ann Arbor, MI). 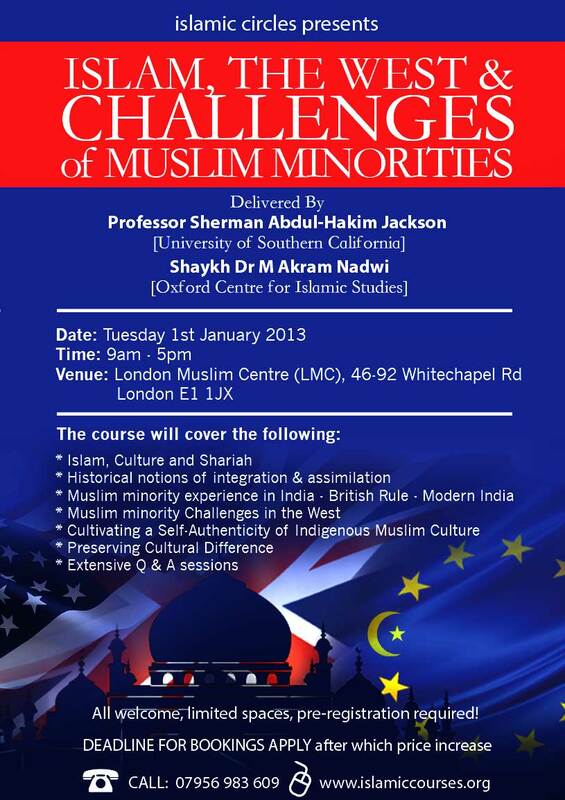 Dr. Jackson has authored several books including On the Boundaries of Theological Tolerance in Islam: Abu Hamid al-Ghazali’s Faysal al-Tafriqa (Oxford, 2002), the controversial Islam and the Blackamerican: Looking Towards the Third Resurrection (Oxford, 2005) and most recently Islam and the Problem of Black Suffering (Oxford, 2009). Dr. Jackson received his Ph.D. from the University of Pennsylvania (Philadelphia, PA) in 1991 and has taught at several institutions including the University of Texas (Austin, TX), Indiana University (Bloomington, IN) and Wayne State University (Detroit, MI). Currently Dr. Jackson is the King Faisal Chair in Islamic Thought and Culture and Professor of Religion and American Studies and Ethnicity at the University of Southern California (Los Angeles, CA). Dr. Jackson has served as the Executive Director of the Center of Arabic Study Abroad (Cairo, Egypt). Additionally, Dr. Jackson is a former member of the Fiqh Council of North America, form Presdient of the Shari’ah Scholars’ Association of North America (SSANA) and a past trustee of the North American Islamic Trust (NAIT). He has contributed to several publications including Washington Post-Newsweek blog, On Faith, and the Huffington Post. 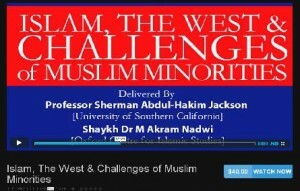 Dr. Jackson is listed by the Religion Newsriters Foundation’s ReligionLink as among the top ten experts on Islam in America and was named among the 500 most influential Muslims in the world by the Royal Islamic Strategic Studies Center in Amman, Jordan and the Prince Alwaleed Bin Talal Center for Muslim-Christian Understanding. Shaykh Dr M Akram Nadwi is leading scholar steeped in traditional Islamic learning and in modern academia who studied and taught Shari’a at the Nadwatul ‘Ulama (India). A Muhaddith specialising in ‘Ilm al-Rijal (the study of the narrators of Hadith), Shaykh Akram has ijaza (licenses) from various mashayakh, including Abul Hasan Ali Al-Nadwi, Abdul-Fattah Abu Ghuddah, Sayyid Muhammad Alawi al-Maliki, Dr Muhammad Sa’id Ramadhan Al-Buti, al-Kattani, al-Ghumari, and Yusuf al-Qaradawi. He has authored and translated many titles on Fiqh, Qur’an and Hadith including his monumental 40 volume work on Al-Muhaddithaat – The Lives of Female Scholars of Hadith. A recipient of the “Allama Iqbal” prize for contribution to Islamic thought, and is currently, a research fellow at the Oxford Centre for Islamic Studies, Oxford University.